Connecting companies and carriers when they need it most. Fill out a quick form entering your load/trip details, publish it, and immediately let business partners find you. Carriers can search loads to fill their truck while companies & brokers can locate carriers to deliver their goods, anytime, anywhere. Pick up the load and get moving! Moving Pipe founded as a result of: observation, identification of a problem, and the need to provide a solution. With experience of more than 20 years in the private and commercial goods transportation industry, we well understand the problems companies in this industry faces in their daily operation due to their insufficient network of business partners, and the lack of modern tool to help them expand it. We felt this industry was somewhat left behind, technologically speaking, and thought it’s time to move it into the new era and create a modern tool to help these companies streamline their business and run it more efficiently. So what is Moving Pipe? 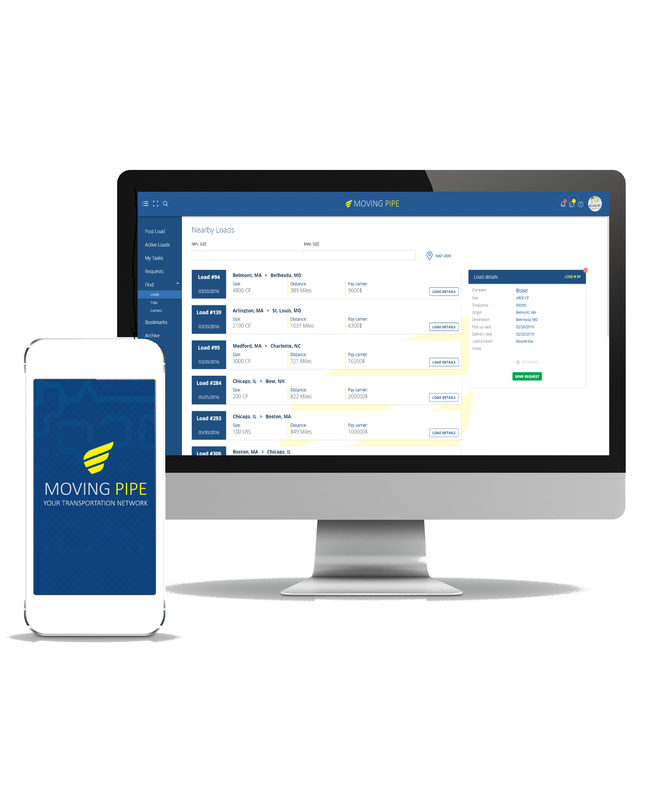 Moving Pipe is a cloud based transportation software that facilitates an instant communication between companies, brokers, and carriers. Our tool lets carriers publish their available space in real-time, while companies can publish loads that need to be transported in an instant. Our web and mobile applications are equipped with 2 distinct, easy-to-use interfaces, one for brokers, and the second for companies and carriers. We provide an advanced interface with unique features to help you manage your fleet more efficiently, and allows you to connect with existing as well as potential business partners. Schedule a demo today and learn how you can benefit from our moving software and start rolling your business towards success. To join us just fill out a quick registration form, select a suitable account that fits your business needs, and start moving your business the MP way. - Search trips posted by carriers. - Keep track of your loads. - Unlimited loads & trips listing. - Search both loads & trips.